First round of fairing on the port toe rail. 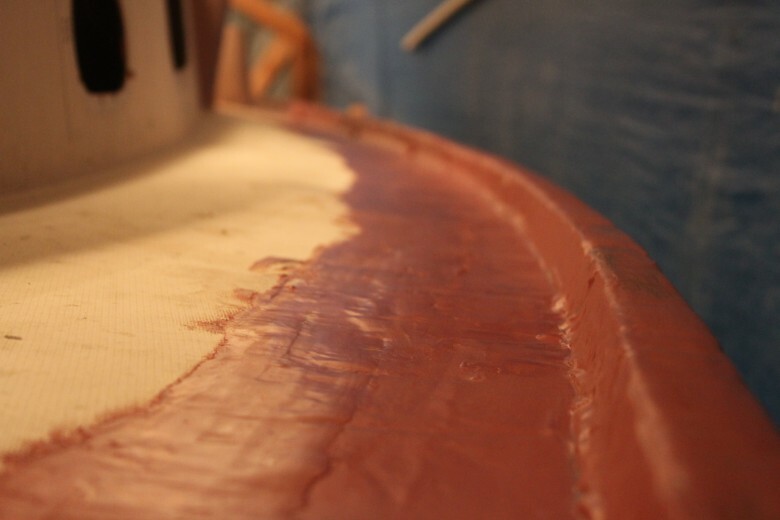 Both the toe rail and bow platform have been adhered, fastened, fiberglassed and faired. They are now permanent parts of the boat and I’m quite happy with the results. The final decision to use the teak toe rail and bow platform that came with the boat, required a fair amount of planning and research. Originally, I had been planning to install bulwarks for their added safety at sea. However, I finally came to the conclusion that using the existing toe rail would be simplest. Not only would I save the original teak toe rail, but I also like the look of toe rails on the B27. Further, I would save money on buying all the fittings and new teak that would go along with a bulwark. You can find all of my bulwark research at the Bulwark Project Page. Regarding the bow platform, originally I had planned on adding a bowsprit, but decided against this modification when I determined to keep the B27 rigged as a Sloop. Previously, I was considering converting to a Scutter Rig, which would require a bowsprit instead of a platform. However, I decided against a Scutter Rig, because it would be simpler to use the existing Sloop Rig and cheaper as well. I’ll likely go into more detail about why I made this decision in a later post. Last night while starting our Wednesday night race series,another boat on port came up on me and we hit starboard to starboard. The result was three long gashes from his bowrail,stantions, etc.I have an old Bristol 35.5,1978 vintage.My question is are these hulls Epoxy or poliester resin? ?I am sure you have done the research. Thanks for your comment and although I haven’t specifically done the research for the B27, I would say with some confidence they were made using polyester resin, as that was the main type of resin used when these hulls were first laid up. That said, if you are looking to do repairs on the gashes, epoxy will do fine over polyester as long as you follow the standard epoxy prep and application steps.